Fresh is the word that comes to mind when I use this laundry liquid from Kin Kin Naturals. If you have ever smelt your clothes just as you have pulled them out from the washing machine you would have probably smelt a somewhat pleasant fragrance but on sniffing again you realise that the smell is highly chemical and artificial and that there is nothing fresh about it! Mainstream laundry detergents are full of nasty chemicals and synthetics designed to make you think that if something smells fresh and clean then it must be. It is not until you start using a natural laundry liquid that one can appreciate the real smell of freshness. 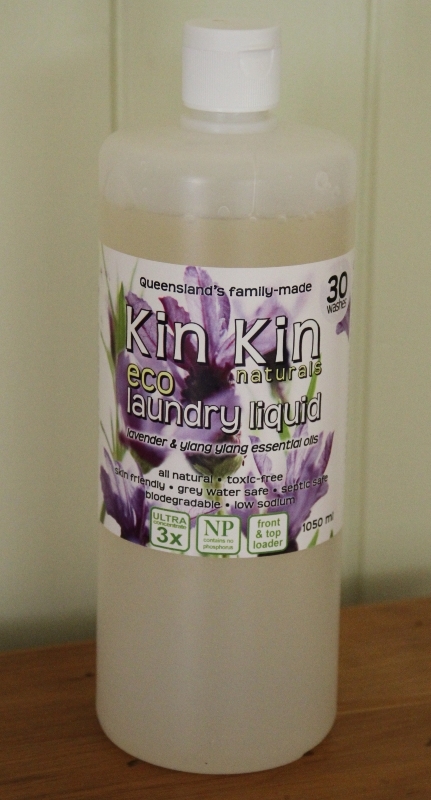 The Kin Kin Naturals Laundry Liquid is a great option for those wanting to stop using chemical ridden detergents. Clothes come out clean and fresh and the fabrics are not damaged by the repetitive use of chemical detergents. The liquid is easy to use. I simply pour into the machine as the water fiills up and then add the clothes. And unlike powders, you won’t have to worry about any white powder residue on your clothes. The only thing that I would like this product to have would be a cap that can also be used as a measuring device. You can get about 30 washes from each bottle which is great value. I have tried the Lavender & Ylang Ylang but you can also buy it in Eucalypt & Tangerine. This product is a must have if you use a grey water system and is also ideal for washing baby clothes etc. The R.R.P is $14.95 and you can purchase the range of Kin Kin Naturals products online at organic stores or various retail stores around Australia. Visit the Kin Kin Naturals website www.kinkinnaturals.com.au to find a store near you. Coconut-derived anionic & non-ionic surfactants (no alcohol ethoxylate, LAS or SLS), rain water, potassium coconut soap, potassium citrate, enzymes, lavender essential oil, organic ylang ylang essential oil, rose geranium essential oil, organic lemon myrtle essential oil. This product was given for review consideration by Kin Kin Naturals. All product reviews and honest opinions on this site are solely that of my own and I am not endorsed or paid for this review. I came across this product at my local organic store and I was drawn to it because it seemed to offer a solution to being a good anti-bacterial cleaner that I could use everywhere in the house. 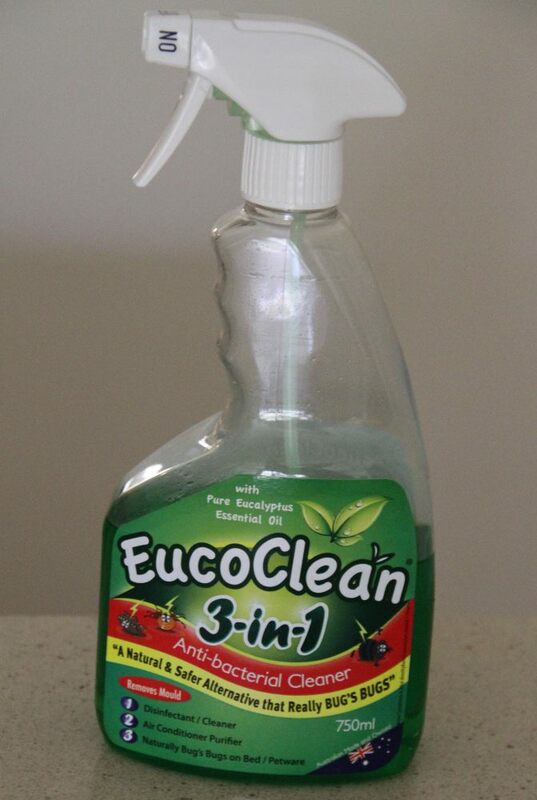 This cleaner is made with pure eucalyptus essential oil which gives it its anti-bacterial properties. The spray bottle is very handy and I use it to disinfect the toilet, bathroom and kitchen benches and I also pour a little into some hot water to mop the floors with. I even add a little to the washing machine when I wash the dish cloths etc. Overall, it a is a very good cleaner and I feel better knowing that it hasn’t got any nasty chemicals in it and is better for the environment. The smell is nice and natural and I have even sprayed it onto some fabric furniture to freshen it up a little. This product also removes mould which is great. I definitely recommend this cleaner as a good general cleaner and disinfectant to have around the house! This product does not contain D.E.E.T., insecticides, pesticides, naphthalene or pyrithium. I love the fresh smell of this natural dishwashing detergent from Kin Kin Naturals. And best of all, it is very ecomonical and lasts a long time. You only need to use a little at a time and the spout has good liquid dispensing control. The ingredients are all natural and it is quite effective on grease too. For stubborn pots and pans I just soak for a little with some water and dishwash liquid first. When making the transition to natural cleaning products, it is hard to let go of the soapy suds but with this product you know you are getting a good clean, a great smell and no harmful chemicals are being used on your plates, glasses and also your hands. 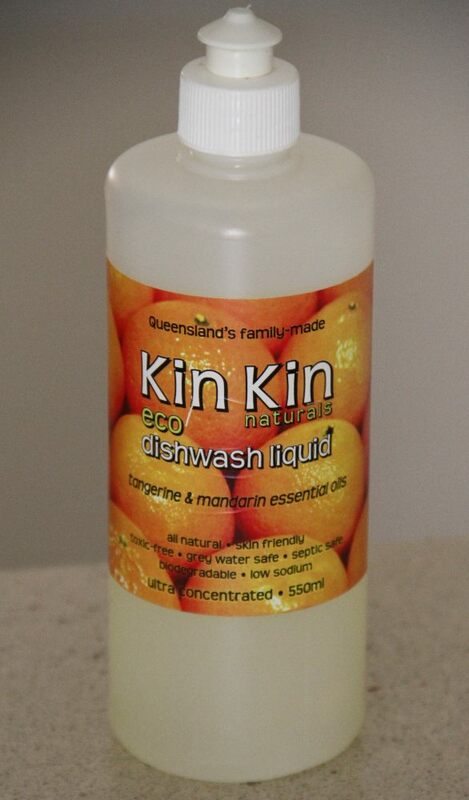 Kin Kin Naturals is a family based brand based here in Queensland and their products consist of kitchen and laundry detergents. More information about their products can be found on their website Kin Kin Naturals. Coconut-derived anionic & non-ionic surfactants (no alcohol ethoxylate, LAS or SLS), rain water, potassium citrate, glycerine, tangerine essential oil, organic mandarin essential oil. 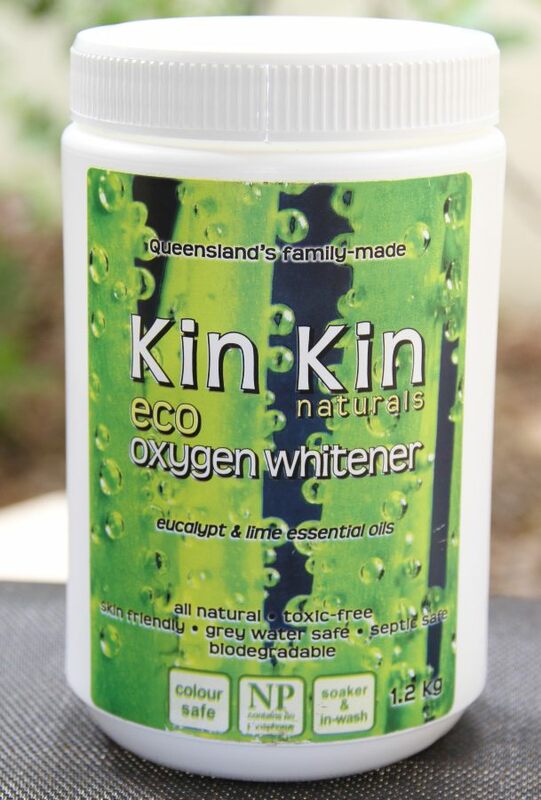 For all of those who cannot let go of their dependency on Napisan, then let me urge to try Kin Kin Naturals Eco Oxygen Whitener! Like many others out there, I relied on good ol’ Napisan for brightening the laundry and removing stubborn stains. It was difficult to let go but I knew that I couldn’t keep using such a toxic product. Thankfully, this eco oxygen whitener does a great job and I know it is better for me and the environment. This natural version of Napisan also helps sanitise yor laundry and I love the fresh natural smell. I add about half a lid to every load of washing and I am so far really happy with the results. Sodium carbonate (washing soda), sodium percarbonate (oxygen releasing soda, rather than a chlorine bleach), sodium citrate (water softener based on citrus rather than poorly biodegradable petrochemicals), sodium bicarbonate (baking soda), anionic surfactant (no SLES, LAS or alcohol ethoxylate), lime essential oil, organic eucalypt essential oil. There are not too many choices when it comes to dishwasher powders and I am not confident using my dishwashing detergent liquid that I use for manual washing in the dishwaser machine like some suggest. However, I am glad that Ecostore has made a convenient and affordable option as I can’t live without my dishwasher! I like the convenience of using this powder and the 1kg container has an easy pouring spout. 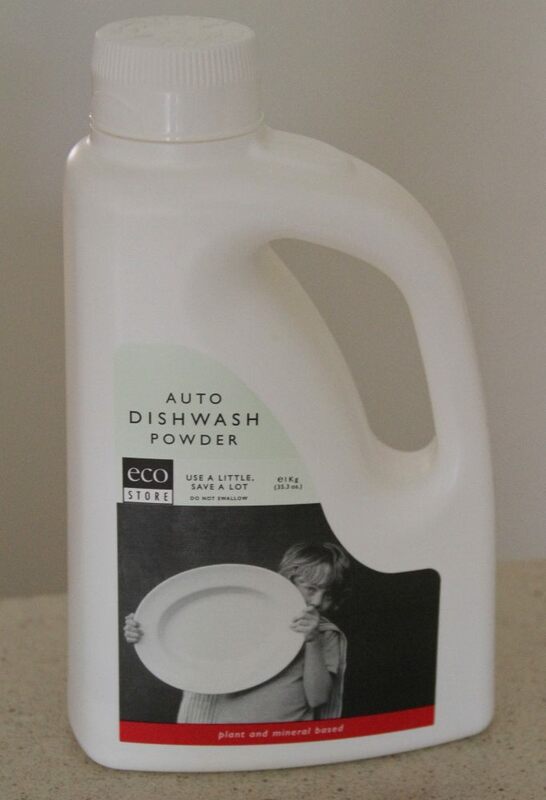 This product is plant and mineral based and does not have any of the usual toxic ingredients that you find in your regular dishwashing powders or tabs from Finish etc. Ecostore is a New Zealand company and although it is not Australian it is still good to support our local neighbours. Sodium Carbonate, Sodium Citrate, Sodium Bicarbonate, Sodium Percarbonate, Sodium Metasilicate, Lauryl/Myristyl Alcohol, Ethoxylated & Propoxylated, Sodium Polyaspartate, Amylase, Protease, Natural Citrus Oil.